Apprentices have the same rights as other employees. You are entitled to a contract of employment, and a minimum of 20 days paid leave each year, plus bank holidays. You will work at least 30 hours per week with your employer, and undertake part-time study through a mixture of day/block release, distance, and e-learning. Your employer and university, college, or training provider will set out details of what they will provide and what they expect from you as an apprentice, both as an employee and as a student, in two key documents. The apprenticeship levy is celebrating its two year anniversary. Here’s what you should know. Two years ago, we introduced the apprenticeship levy to create long term sustainable funding for apprenticeships and to give employers more control to provide their staff with a range of training opportunities. The number of investigations launched by HMRC into the underpayment of the Apprenticeship Levy has more than doubled in a year to 84, up from 33 in 2017/18, says UHY Hacker Young, the national accountancy group. HMRC collected an extra £6.2m through these investigations last year, up from £5.2m in 2017/18. UHY Hacker Young says a growing number of businesses are finding the Apprenticeship Levy complex and difficult to comply with. This is leading to businesses underpaying which potentially leaves them exposed to substantial fines. The Department for Education is accountable for the apprenticeships programme, including securing value for money. The Education and Skills Funding Agency is responsible for apprenticeships policy and funding, and for overseeing the delivery of apprenticeships. The apprenticeships programme is intended to help address two important problems: poor productivity in the United Kingdom compared with many international competitors; and a significant fall in employers’ investment in training over recent decades. Education secretary Damian Hinds has insisted the UK’s workplace training is “coming of age” with the apprenticeship levy, and defended restrictions in the new system that many businesses complain about. Mr Hinds, speaking ahead of National Apprenticeship Week, which started on Monday, accepted companies had “frustrations” with the system. But he said increasing numbers of employees had been taking up high quality apprenticeships since large companies and public sector organisations were required by the government in 2017 to contribute the equivalent of 0.5 per cent of their total wage bill to fund workplace training. In an interview with the Financial Times, Mr Hinds also said the UK’s looming departure from the EU made the task of reinvigorating skills-based training more urgent. 28 February 2019 DfE published their Apprenticeships and levy statistics: February 2019. There has been 192,100 apprenticeship starts on the frameworks and new standards reported to date between August 2018 and December 2018 for the 2018/19 academic year, a 9.7 per cent increase compared to the equivalent period in 2017/18 (175,100). At 31 January 2019, there have been a total of 16,400 accounts registered on the apprenticeship service. We have seen 122,700 commitments recorded in the apprenticeship service for the 2018/19 academic year, compared to 98,000 recorded at the equivalent point last year for 2017/18. [A commitment is where a potential apprentice, who is expected to go on to start an apprenticeship, has been recorded on the Apprenticeship Service]. “Apprenticeships offer people of all ages and backgrounds a high quality route to skilled employment with the option to train at every level. You get paid while you train and can start a great career in a huge range of professions like accountancy, nursing, teaching and law. “I want as many people as possible to know about the amazing apprenticeship opportunities out there. Our new campaign ‘Fire it Up’ is playing a vital role in this, helping to challenge outdated perceptions and raising awareness of the huge variety of options available”. The AELP highlighted Intermediate level starts are at 5,800, down 23% from 2017 and 56% from 2016. So less than half pre-Apprenticeship Levy. Apprenticeships within the Civil Service. 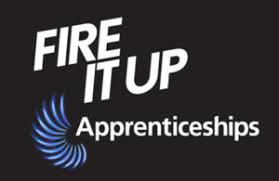 The government has launched its new ‘Fire it Up’ campaign to showcase the diverse range of opportunities available to apprentices. 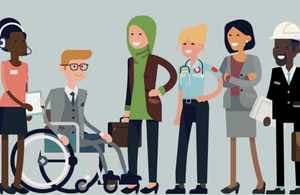 The new campaign aims to inspire and engage employers as well as individuals and education providers in apprenticeships. To support employers with promoting the campaign, DfE has created a communication toolkit which gives information and guidance on how to promote apprenticeships through your social media channels. The Defence Science and Technology Laboratory has a number of new apprenticeship vacancies – see their post on gov.uk below. At Dstl, we are committed to developing our people, and to investing in the next generation of talent. We offer apprenticeships in a variety of roles which enable people to gain experience and an insight into some truly unique work that helps protect the nation. Our apprenticeship programmes range from advanced through to degree level. If you are thinking about your next step in education, or a change of direction in your career, then Dstl could be the place for you. Choosing an apprenticeship programme gives you a breadth of experience and a qualification and you will earn a salary at the same time. With a mix of classroom and on-the-job -based learning, our programmes offer you the chance to work on cutting-edge real projects, making a real difference to the defence and security of the UK. The apprenticeship budget will be “alright” for the rest of the year, the skills minister has said. Anne Milton (pictured) was speaking exclusively to FE Week following a parliamentary debate on apprenticeships and skills this afternoon. She was asked if she had any concerns about the size of the apprenticeships budget, following reports late last year that it was heading for a £500 million overspend in 2018/19. “I always want more money – the more we’ve got, the more we can do with apprenticeships,” she said in response.